Many medium to large organizations have organization-sanctioned mentoring programs. Learn about yours. If you enjoyed this, check out our public Facebook Page and subscribe to our email list. If this was useful, please support this community work. You can buy me a coffee, sponsor a newsletter, or sponsor a project via the website. The U.S. Center for Medicare and Medicaid Services (CMS), whose coverage policies are intertwined in hospital and medical center systems, has announced a call for public comment on the topic: “acupuncture coverage for low back pain”. To my knowledge, this is the first time in history the CMS has ever announced a public comment call for anything related to coverage of acupuncture services. Tell your hospital sponsors and advocates. If CMS reimbursed for acupuncture and other integrative health therapies, that would be a major milestone. The NIH grant announcement is here: https://grants.nih.gov/grants/guide/rfa-files/RFA-AT-19-005.html. Go to the announcement to submit your comments. NCCIH and NIH funding if you work in pain management or addiction, especially the field of opioid addiction. If you have heard me talk about the National Pain Strategy document the past couple years, HEAL builds upon parts of the work laid out in that very large federal public document. General announcement from December 2018. Learn more about the HEAL initiative at this webpage. National Academy of Medicine (NAM) 2018 “Non-Pharm Pain” Conference. The recordings from this conference are now available to view. I added the NAM playlist for this conference to the HH Project channel’s library. Thank you to ACIH for announcing this information. The NAM conference was 2 days, so the recordings playlist is long. So far, I recommend the first video with Dr. Cherkin. Here is the link to the playlist. Here is the link to this NAM conference agenda, to help you choose recordings most interesting to you. The next IMTRC conference is May 9-10, 2019 in Alexandria, Virginia. Massage Therapy Foundation Research Grants for 2019—applications are now open. Submission deadline is March 1st, 2019. Massage Therapy Foundation Community Service Grants for 2019—applications are now open. The January 17th, 2019, webinar was on "Untangling the Terms: Endpoints, Items, Outcomes, PROs, PROMS, PRO-PMs" with Ashley Slagle, MS, PhD. For more about this series and to watch the latest webinar, go to the FDA Roadmap Lunchtime Listen recommendation post. As an east Asian medicine practitioner (acupuncturist) I have been teaching my patients diaphragmatic breathing on day one and reinforced practice throughout treatment course with related self-care homework. This breathing practice often also called "belly breathing" has been known for a long time to help us consciously switch our breathing state into the parasympathetic state (rest and digest). Because, in our modern world, most people go about their day in sympathetic state of breathing (fight or flight). Breathwork, the conscious control of your breath, is the foundation of qi gong and mindfulness practices. follow the tag/label in this blog for "research literacy"
If you enjoyed this post, subscribe to our email list for the latest updates and follow us for "research and metrics Thursdays" on the public Facebook Page. buying me a coffee or sponsoring a newsletter via our website. Thank you. In East Asian Medicine, we know that, for best long-term self-care and health maintenance, we prescribe patients foods to incorporate in their diet. Why? To manage their conditions and support their constitution. For example, individualized TCM nutrition consults was a self-care session I would do with my chronic pain patients when they were interested in learning more about food as basic support system for health. As a board-certified TCM herbalist (NCCAOM®-board certification), it took me time to research and put their personalized plan together. And, for a patient, modifying diet takes courage and commitment and follow up. There is a new resource for helping patients learn and practice cooking healthy meals coming to a neighborhood medical facility or academic center near you, the "Teaching Kitchens". Well, maybe not so new. Several of these teaching kitchens have been around for a decade, but the hope is, that with the collaborative now helping stand-alone centers connect to more resources, that the movement will grow and expand. What is this new resource for providers and patients? Dr. Eisenberg was an early advocate of the integrative health paradigm and, from the enthusiasm and success of the Healthy Kitchens Healthy Lives® conference, launched The Teaching Kitchen Collaborative (TKC). The resource-sharing collective that the TKC can be, has the potential to encourage academic health institutions to recognize that nutrition and lifestyle change are viable part of the treatment plan. TKC launched in 2016 by the Harvard T.H. Chan School of Public Health-Department of Nutrition and The Culinary Institute of America (CIA). 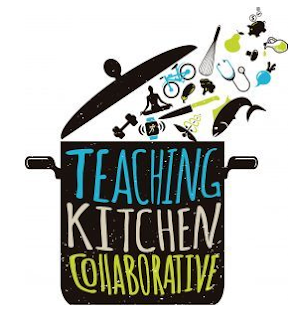 The TKC "is an invitational network of over 30 organizations using teaching kitchen facilities as catalysts of enhanced personal and public health. The TKC's mission is to enable early adopters to learn about one another's facilities and educational programs, to develop best practices for reproducing and scaling emerging models, and to document the clinical, behavioral, and financial impact of teaching kitchens for a broad range of populations." The TKC regularly hosts research days or other opportunities to share your program’s story, progress, and research. If you are already doing this work, the TKC seems like a great way to share what you are doing and be connected to others doing similar work. It seems like it would be a good place to support each other while changing the U.S. culture of health, wellness, and “food as grounding for health”. “[Teaching] kitchens, when used appropriately for different populations in different settings, will change behaviors for the better…will change health outcomes for the better…will be sustained changes." Is your program or hospital system connected to this resource? David M. Eisenburg. The Journal of Alternative and Complementary Medicine. Jul 2018. http://doi.org/10.1089/acm_2018.29052.dme. volume: 24 Issue 7: July 1, 2018.